Faced with a threatening police presence, the occupiers of the British Gas offices have now decided to leave on their own terms. 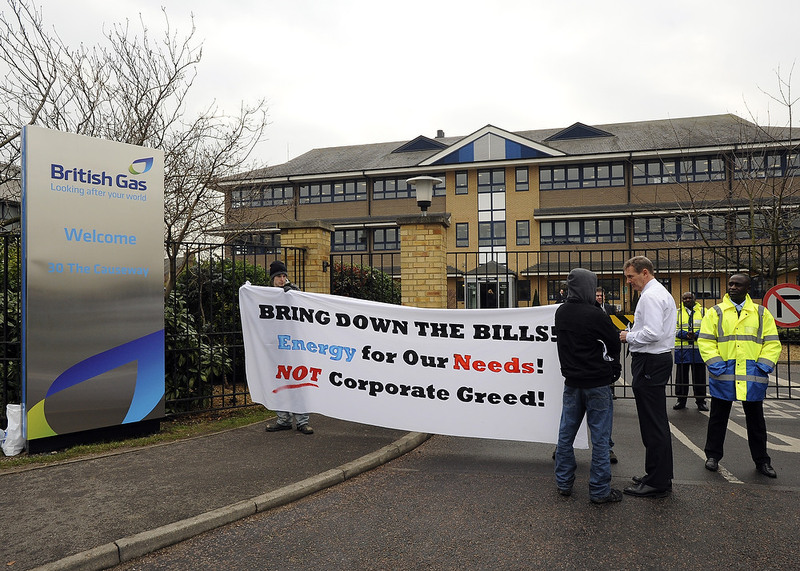 But while they were inside, British Gas MD Phil Bentley decided to come out and talk to the protestors outside. The writeup below is from the #heatoreat blog. There are times during protests where you feel those in power aren’t listening. That they shut themselves away in a cocoon of expensive lunches, executive meetings and fancy cars. Today, in response to Fuel Poverty Action’s occupation of his offices, Phil Bentley (CEO of British Gas) broke that mould and is probably now wishing he hadn’t. As Fuel Poverty Action activists stood outside in the biting cold leafleting this morning, out strolled the suited figure of a man who looked very much like the millionaire CEO. That’s because it was. Bentley, whose floor had been occupied by a group protesting against the 2,700 preventable deaths last year from Fuel Poverty, looked like he had a point to prove. “Yes of course”, replied to well paid CEO. Bentley then reeled a list off of who was to blame [apart from him of course]. Firstly the Government, who had denationalised our energy provision back in the 1980s, allowing all the juicy profits to go to CEOs and Investors, said the CEO and investor in British Gas. He then blamed investment in renewables for the exorbitant rise in prices in recent years. Our very well informed man on the door quoted back figures that showed that between 2005 to 2010 the average duel-fuel bill went up by £455 (a 75% increase) and of this rise, 84% was un-related to low-carbon measures . Bentleys answer to this; he didn’t have one. So what do we take from this encounter? Well, for one the CEOs of big companies are criminally out of touch with the day-to-day realities of the Six Million homes that live in fuel poverty in the UK alone. Indeed Bentley seems to suggest some of their lives are worth sparing for the comfy life he leads. On a more whimsical note we’ve learnt why the rich and powerful don’t tend to show their faces and speak their minds, because half the time they just don’t have a clue. Next PostNext The Warm-up weekend comes to an end as the movement for energy justice grows….